This page is designed to complement the information available from our City of Boroondara Economic Profile. In the 2016 Census, Boroondara's resident labour force (people aged over 15 years who are employed, or who are unemployed and looking for work) was 87,096 people (52.1% of the total population). 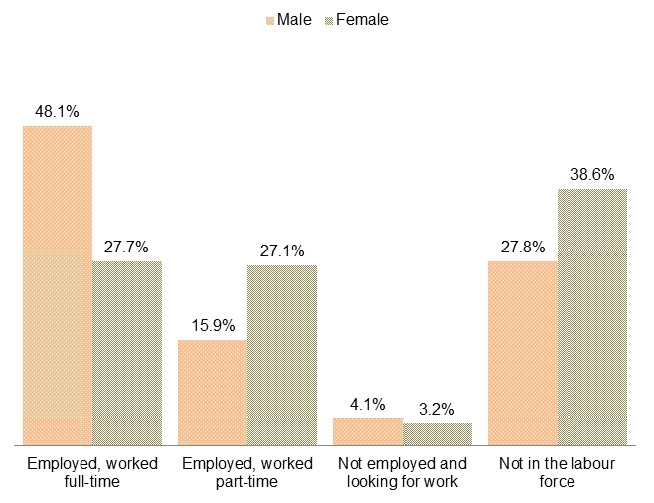 Figure 1 shows females are less likely to work full-time (27.7% of all females compared to 48.1% of all males), and more likely to work part-time (27.1% of all females compared to 15.9% of all males), or to not be in the labour force (38.6% of all females compared to 27.8% of all males). Males are more likely to work full-time in every stage of life, however the gap widens from age 35 to 44 years where 78.3% of all males are working full-time compared to 37.5% of all females (see Table 1). In the 2016 Census, 23,110 Boroondara residents reported that they worked in the City of Melbourne area (28.1% of all employed Boroondara residents), and 21,600 reported that they work locally within Boroondara (26.3%). The number of people that work within Boroondara, including non-residents, is 71,353, which is 9,439 more people than in the 2011 Census results. 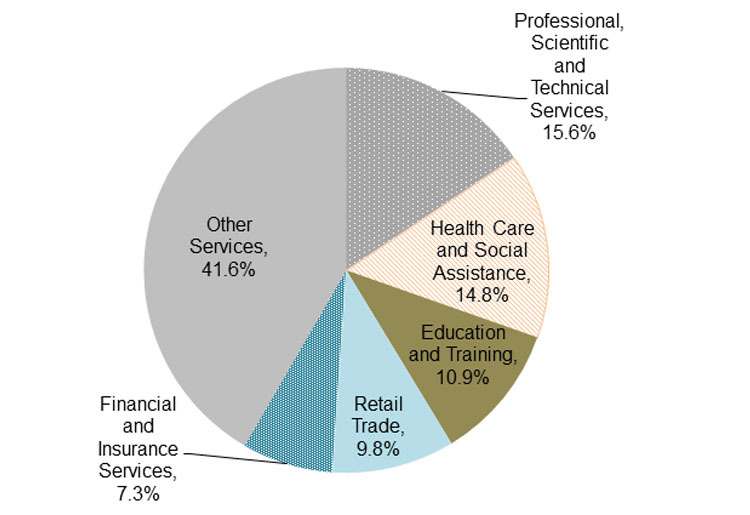 The largest percentage increase in workers between 2001 and 2016 occurred in the rental, hiring and real estate services industry (24.2%) and the largest percentage decrease in the number of workers was in the wholesale trade industry (-25.7%). In the 2016 Census, more than half the Boroondara residents in paid work were employed in managerial roles or as professionals. Overall, the top four professions were sales assistants and salespersons (4,580), school teachers (2,856), accountants, auditors and company secretaries (2,751), and medical practitioners 2,723). rental, hiring and real estate services. Boroondara is generally an affluent area with 43% of households in the 2016 Census reporting a weekly income that falls into the top quartile for Victoria ($2,395 and over). However, 8.4% of households reported a household income less than $400 per week and 17% of households have a weekly income of less than $740, the lowest income quartile for Victoria. Table 2 shows the number of households in each suburb that reported a weekly income of less than $400. 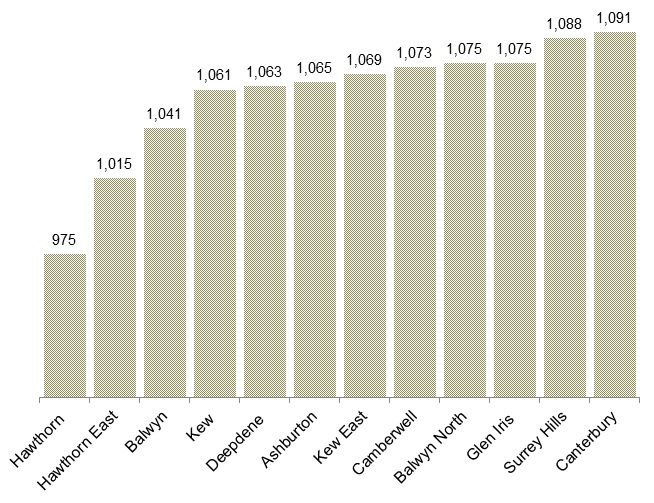 Hawthorn and Balwyn North had the highest number of households on $400 or less (2,056 and 2,010 respectively), followed by Kew (1,718), Balwyn (1,512), Camberwell (1,479), Hawthorn East (1,193), and Glen Iris (820). The remaining suburbs (Ashburton, Canterbury, Deepdene, Kew East, and Surrey Hills), all had less than 600 households reporting an income of $400 or less. The suburbs where more than 10% of households reported incomes of less than $400 weekly were Balwyn (11.9%), Deepdene (11.4%), and Balwyn North (10.3%). Unpaid domestic work includes food or drink preparation and cleaning, laundry, gardening, home maintenance and repairs, and household shopping and finance management. Information about unpaid domestic work is collected for people aged 15 years and over in the Census. 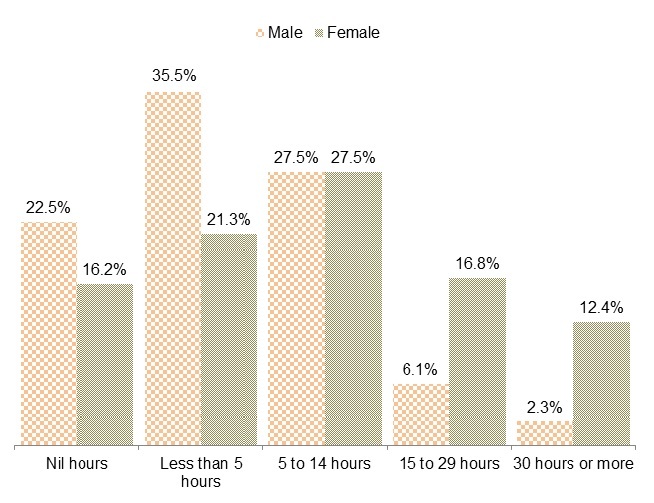 Figure 3 shows that females were more likely to spend more hours doing unpaid work. Around 30% of females reported doing more than 15 hours of unpaid domestic work per week compared to 8.5% of males. For males, the most often reported range of hours of unpaid domestic work done was less than five hours (35.5%), followed by 5-14 hours (27.5%), and nil hours (22.5%). Residents aged 65 to 74 years reported doing more hours per week of unpaid domestic work than any other age group (33% doing more than 15 hours per week). Young people aged 15 to 24, and 25 to 34 years, reported doing the least unpaid domestic work (98% and 90% respectively doing less than 15 hours per week (see Table 2). In general, females were more likely to have spent time caring for a child or children (under 15 years) without pay in the two weeks prior to Census night 2016 (30% compared to 25% for males). 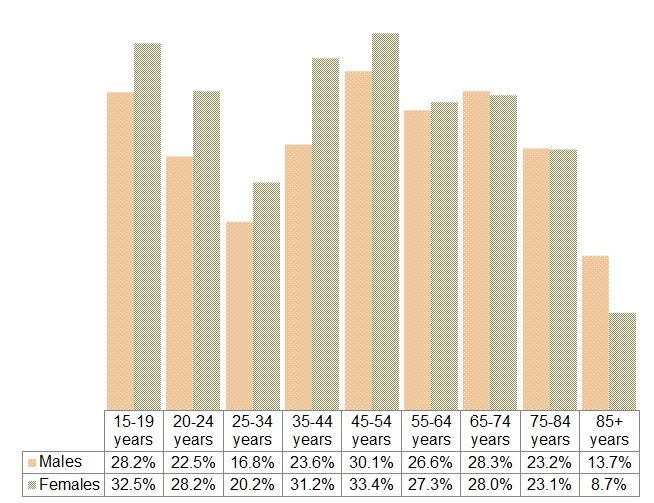 Figure 4 shows that this was consistent across all age groups, with the biggest differences in rates of care occurring among residents aged 35 to 44 years (57.5% of males compared to 67.9% of females), and 65 to 74 years (24.4% of males compared to 34.9% of females). One exception is the 45 to 54 years age group where males and females generally spent a similar amount time caring for children, a trend also apparent for Greater Melbourne. This is also the age group at which almost one in four women provide unpaid assistance to someone with a disability, long-term illness or problems related to old age. 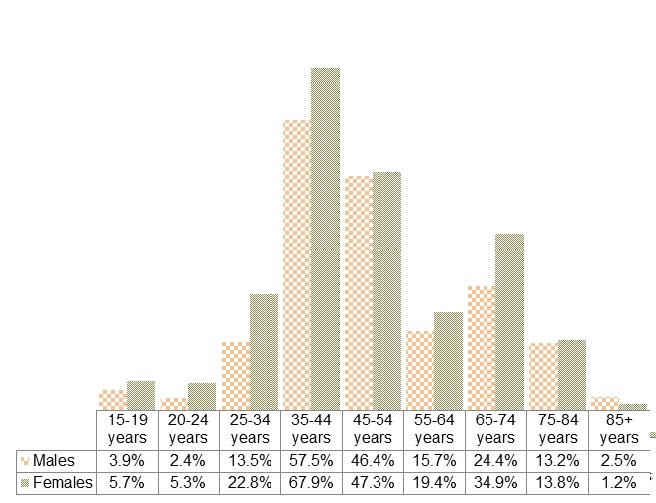 Figure 5 shows that across all age groups except over 85 years, females were more likely to have spent time providing unpaid care, help or assistance to someone with a disability, a long-term illness or problems related to old age during the two weeks prior to the 2016 Census night. Both males and females were most likely to provide care to someone with a disability when they were aged 55 to 65 years (17.9% of males and 26.4% of females). Slightly more than a quarter of Boroondara residents aged 15 years or over reported that they had done unpaid voluntary work through an organisation or group in the 12 months prior to Census night 2016 (26.0%), a rate higher than in Greater Melbourne (17.6%). 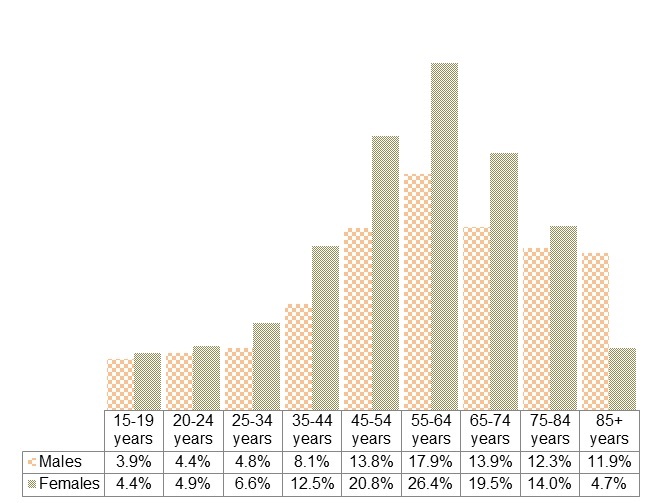 Figure 6 shows the groups most likely to report being a volunteer were females aged 45 to 54 years (33.4%), females aged 15 to 19 years (32.5%), and females aged 35 to 44 years (31.2%). In all ages up to 65 years, females are more likely to volunteer however from age 65 years onwards, males are more likely to volunteer. Although a generally affluent city, Boroondara is also a place of socioeconomic diversity. The ABS Index of Economic Resources (IER) focuses on the financial aspects of relative socio-economic advantage and disadvantage, by summarising variables related to income and wealth from the Census. This index excludes education and occupation variables because they are not direct measures of economic resources. It also misses some assets such as savings or equities which, although relevant, could not be included because this information was not collected in the 2016 Census (ABS 2018). A low score indicates a relative lack of access to economic resources in general. A high score indicates relatively greater access to economic resources in general. Figure 7 shows the IER score for each suburb in Boroondara. Hawthorn, Hawthorn East, and Balwyn have a relative lower access to economic resources than other suburbs in the municipality. On the other end of the rankings, Canterbury, Surrey Hills, and Glen Iris have a relatively higher access to economic resources than the other suburbs. The number of people who receive a Department of Social Services Centrelink payment can be also be used as an indicator of disadvantage in the community and/or an ageing population. Table 3 shows the number of people receiving a low income card, and a Commonwealth seniors health card has increased in the two years to 2017. However, the other types of payments including the Age pension, carer payment, carer allowance, disability support pension, and Newstart allowance have gone down in number.